Sports fans—and perhaps football fans in particular—know that supporting a team over an entire season can be an emotional roller coaster. There are moments of excitement, pure joy, and crushing defeat that are all core components of any true fan’s experience. It is a fascinating part of human culture that we care so much about our sports teams and let their performances affect our emotions so strongly. A great thing about Facebook is that it provides a place to freely share our emotions with our friends through status updates. Collectively, these status updates can tell a story about how the millions of NFL fans on Facebook experience the highs and lows of a football season. 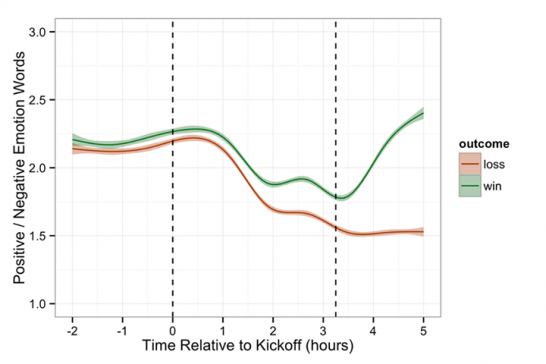 To measure fan emotion, we anonymously tagged millions of status updates over the course of the season as pertaining to specific NFL teams and then counted the number of positive and negative emotion words (from a predefined list) in each post. The ratio of positive to negative emotion words provides an intuitive and useful measure of how people are feeling about their teams.